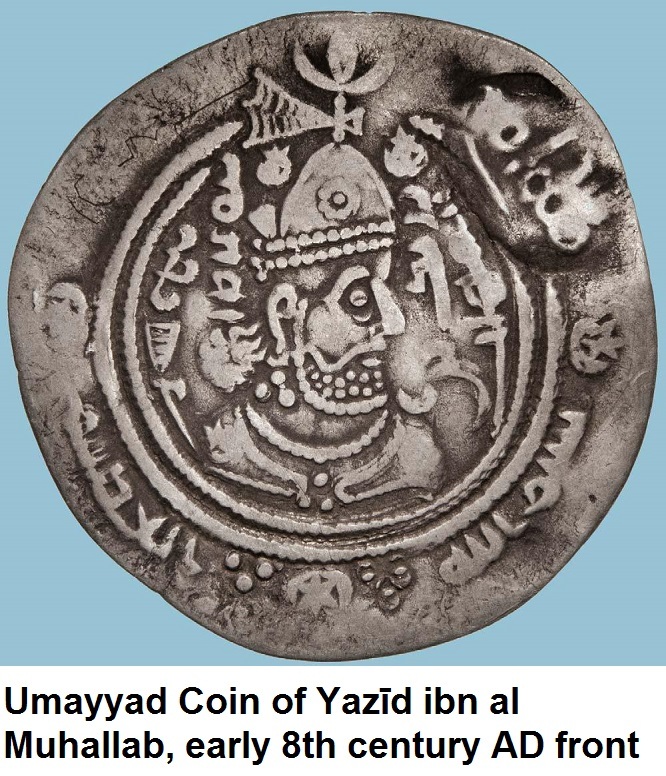 Coins can tell us that Islamic terrorism is Turkic and Jewish; they are the faces of the same coin of terrorism. 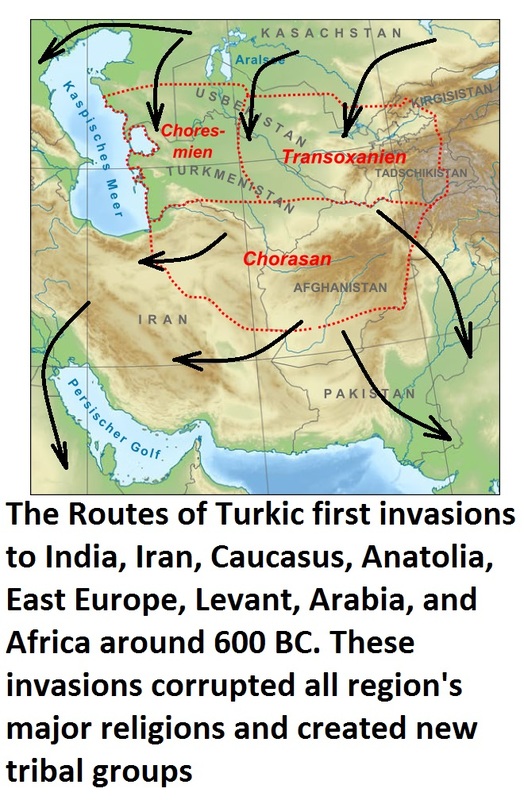 There are a lot of other coins that reveal the true relationships between Turkic Islam and Turkic Judaism who are the only perpetrators of all forms of terrorism since the Kingdom of Khazaria, Eastern Tourkia, (650–1048). 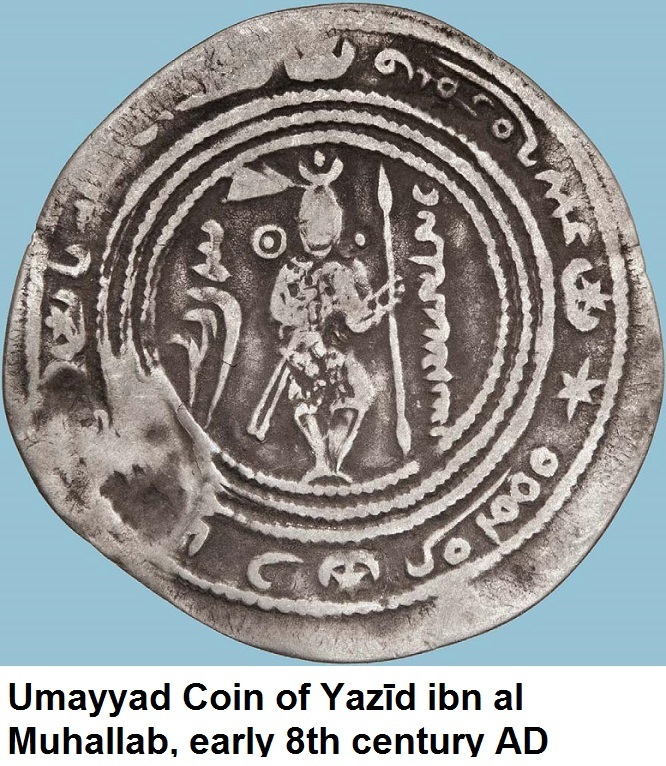 A coin made during the Umayyad rule in Iberia. It is carrying Jewish menorah Quintet and writing in Arabic (Muhammad is the messenger of God) on the other side. The above coin was made during the Umayyad rule in Iberia “Andalusia”. 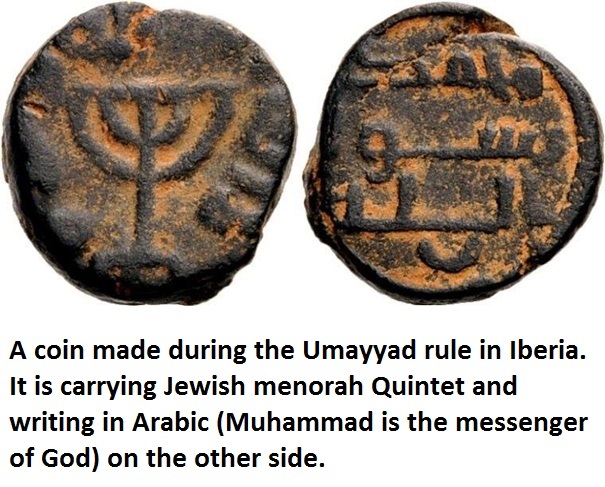 It is carrying Jewish menorah Quintet and writing in Arabic (Muhammad is the messenger of God) on the other side. This is further proof that the colony of Andalusia was Turkic claiming to be Islamic and it was in name only colonized by Arab Umayyad but actually it was run by Jewish Turkmens. And, when the Spaniards and Portugal fought them to liberate Iberia the Ottomans panicked. When those colonizers were defeated and expelled the Ottoman sultan sent ships to evacuate them and take them to Anatolia which was occupied by the Turkic Ottomans in 1299 and then they called it Turkey in 1923. Since their expulsion from Iberia the Turks, under the pretenses of Islam and Judaism, worked to establish the state of Israel. The above coin carries symbols of crescent and David star. The moon and star are Turkic symbols represent their worship of Tengri, and not related to Islam. 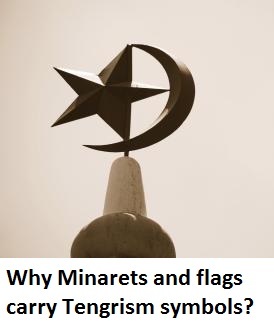 Why Minarets and flags carry Tengrism symbols? Al-Andalus (Arabic: الأندلس‎‎, trans. al-ʼAndalus; Spanish: al-Ándalus; Portuguese: al-Ândalus; Catalan: al-Àndalus; Berber: Andalus), also known as Muslim Spain or Islamic Iberia, was a medieval Muslim colony occupying at its peak most of what are today Spain and Portugal between 711 and 1492. The golden age of Jewish culture in Spain coincided with the Middle Ages in Europe, a period of Muslim rule throughout much of the Iberian Peninsula. During intermittent periods of time, Jews were generally influential and Jewish religious, cultural, and economic life blossomed. Jews began to occupy an economic niche as moneylenders in the Middle Ages. While the Church condemned usury universally only Jews were allowed to take interest on loans, since canon law was only applied to Christians and not to Jews. Eventually, the majority of the European Jewish community was engaged in financial occupations, and the community was a financially highly successful part of the medieval economy. In the early modern period, a court Jew, court factor or Sheckler (German: Hofjude, Hoffaktor) was a Jewish banker who handled the finances of, or lent money to, European royalty and nobility. In return for their services, court Jews gained social privileges, including in some cases being granted noble status. Court Jews were needed because prohibitions against usury applied to Christians, but did not apply to Jews. Examples of what would be later called court Jews emerged in the High Middle Ages when the royalty, the nobility, and the church borrowed money from money changers or employed them as financiers. Among the most notable of these were Aaron of Lincoln and Vivelin of Strasbourg. Jewish financiers could use their family connections to provide their sponsors with finance, food, arms, ammunition, gold, and precious metals. In the late 18th century court Jews such as Samuel Bleichröder, Mayer Amschel Rothschild, or Aron Elias Seligmann successfully detached their businesses from these courts and established what eventually developed into full-fledged banks. The Crusades were a series of religious wars sanctioned by the Latin Church in the medieval period, especially the campaigns in the Eastern Mediterranean with the aim of capturing Jerusalem and the Holy Land from Turkic groups and defend Christian pilgrims. The First Crusade arose after a call to arms in a 1095 sermon by Pope Urban II. Urban urged military support for the Byzantine Empire and its Emperor, Alexios I, who needed reinforcements for his conflict with westward migrating Turks in Anatolia. The First Crusade also targeted Jews in the Rhineland and in Central Europe. In the Iberian Peninsula Crusader privileges were given to those aiding the Templars, Hospitallers and the Iberian orders that merged with the orders of Calatrava and Santiago. The papacy declared frequent Iberian crusades and from 1212 to 1265, and the Christian kingdoms drove the Muslims back to the Emirate of Granada, which held out until 1492 when the Muslims and Jews were expelled from the peninsula. The Shepherds’ Crusade of 1320 was a popular movement in northern France aimed to help the Reconquista of Iberia. It was a series of attacks on Jews and the nobility and clergy who did not support the liberation of Iberia from Jews and Muslims. In 1290, after 200 years of unrest, King Edward I issued an edict expelling all Jews from England. The expulsion edict remained in force for the rest of the Middle Ages. Oliver Cromwell permitted Jews to return to England in 1657, over 360 years after their banishment by Edward I.
Crusades were expensive; as the number of wars increased, their costs and debts of European monarchs escalated. By the time of the Ottoman conquests, Anatolia had been home to ancient communities of Hellenistic and later Byzantine Jews. The Ottoman Empire became a safe haven for Iberian Jews fleeing persecution, and in its heyday, the city of Thessaloniki had a Jewish majority. The First and Second Aliyah, in preparation for the creation of the state of Israel in 1948, brought an increased Jewish presence to Ottoman Palestine. The Ottoman Empire was the birth place for the Zionist Movement. In the middle of the 16th century, Joseph Nasi (a court Jew), with the support of the Ottoman Empire, tried to gather the Portuguese Jews, first to migrate to Cyprus, then owned by the Republic of Venice, and later to resettle in Tiberias. Finally, Nasi was forced by the Ottoman Sultan Mehmed IV to visit him. To the surprise of his followers, in the presence of the Sultan, Nasi converted to Islam. Due to Joseph Nasi trading connections in Europe, he was able to exercise great influence on Ottoman foreign policy. Among his achievements were negotiating peace with Poland and influencing the new election of the Polish king. During the war between the Ottomans and the Republic of Venice, he encouraged the Ottoman annexation of Cyprus; he was granted a coat of arms by Sultan Selim that indicated he would be given viceregal rank in that colony. Hitler and the Nazis in their wars in Europe and Russia were actually not fighting these nations but rather trying to defeat regimes succumbed to the Turkic Jewish network. They were trying to protect Germany, Europe, Russia, and Christianity from fallen regimes.These acts of Hitler and the Nazis, in Germany and in Europe, could not be described as Anti-Semites, because those Jews are not Israelite and consequently they are not Semites. The accurate definition of these acts against Jews is precisely Anti-Turkic. The long and deep involvement of Turkic groups in Arab and the Israelite faiths allowed them to create their own versions of them. These Turkic versions are represented now by the Islamic and Jewish terrorism. 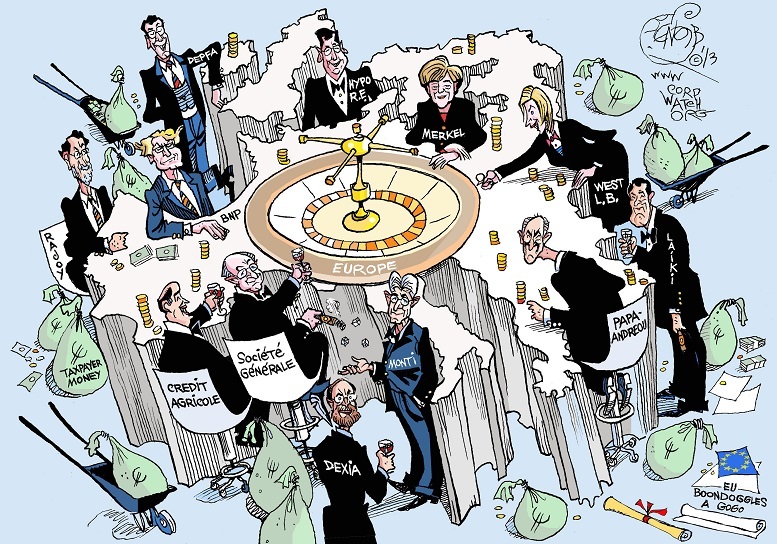 Many experts found a formula to save the Banks and cut the « evil » forces which created the current international banking mess. They advocate to separate Retail/ Personal/ or Consumer banking from bank investment arms which is called Corporate/ business/ or investment Banking. This solution is called “ring-fence rules”. Since 2009, Britain continue to discuss to make banks run retail banking operations as independent banks, almost entirely separate from their investment banking (higher-risk investment activities (“casino banking”)) and overseas operations, as the Bank of England made it clear that there will be no relaxation of the incoming ring-fencing rules. Former Barclays chairman says: Bank ring-fence is redundant and should be scrapped. The ring-fence rules apply to HSBC, Barclays, Royal Bank of Scotland, Lloyds Banking Group, Santander UK and the Co-operative Bank. S&P warns ring-fence could turn UK investment banks into junk. All banks are resisting efforts to split investment and retail banking on the grounds that it would cost billions to establish and reduce their profits. Banks are avoiding and ignoring any reforms or public discussions on “ring-fence rules” aiming for the separation of investment and retail banking. The media and the public are kept in the dark; and politicians who support such reforms are being undermined. Post banks are very popular, secure, reliable, accessible and affordable type of retail/personal/ consumer banking. They are considered major financial services providers in many countries around the world. Japan, Germany, China, South Africa, and India have huge post banks. Debate over re-instituting postal banking in the USA is heating up. Postal banks started in Great Britain in 1861 and, from the outset; the primary goal was financial inclusion. But in the U.S., postal banking had other uses as well. By 1934, postal banks had $1.2 billion in assets—about 10 percent of the entire commercial banking system—as small savers fled failing banks to the safety of a government-backed institution. Deposits also reached their peak in 1947 with almost $3.4 billion and 4 million users banking at their post offices. In 1965 postal banking in USA was ended. Retail/personal/ consumer post banking can be established as independent public banks or operate as agents for private retail/personal/ consumer banks. They can greatly assist in separating Retail Banking from Corporate Banking, and provide accessible and affordable services for wide population. This will, also, give the public postal system revenues to advance and expand their products and services. These services were abolished and ruined with IMF and World Bank policies in most developing countries. Now if anyone wants to send a parcel or transfer money they have to pay huge costs for foreign businesses that amount to theft. Mobile banking could be great boost for national and international postal banking by introducing universal a single cash terminal/cashier in each suburb. All cash deposits and withdrawals could be made there, and these terminals/cashiers shall deliver and receive cash daily to and from different banks and businesses without the need for visiting banks and businesses branches. In this system, the area’s post office shall perform most of the functions of all cashiers for all banks and businesses at a fee. This shall reduce banking costs, create revenues, provide better and easier services, and expand and develop postal and courier products and quality. Transforming Post banks into fully fledged retail banks with intensive mobile banking services and integration with postal, courier and saving systems are obvious and natural development goals. Without separating Retail/ personal/ consumer Banking from Corporate / business Banking individuals always will carry risks and pay unfair costs to compensate for losses incurred from “casino banking” of Corporate / business Banks. Many big Corporate / business Banks in America, Europe and the world bankrupted despite being supported by unseen revenues from Retail/ personal/ consumer banking. It became very clear that No bank is too big to fail. So, the public must be very careful and don’t assume big international corporate banks are safer or better than local small Retail/ personal/ consumer banks. Post banks must be developed and encouraged to compete and go ahead forcing the Separation of investment and retail banking for the public and national interests and for financial stability and economy. Post banks are very important in protecting people and economies from devastating financial crashes caused by casino banking practices.